Globally uniform, high-quality meteorological data are required for accurate weather forecasting and appropriate global climate monitoring. 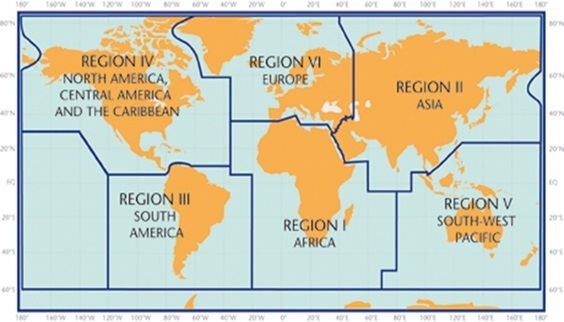 With this in mind, the World Meteorological Organization (WMO) recommended the establishment of Regional Instrument Centres (RICs) for each of its six Regions (as shown in the figure below) in 1986 in order to maintain the meteorological instruments of individual countries to a high standard of accuracy and train instrument specialists. At present, the 16 countries listed below actively operate RICs for Regional Associations (RAs). to be assessed by a recognized authority, at least every five years, to verify its capabilities and performance. To carry out its corresponding functions as below. assist Members of the Region in calibrating their national meteorological standards and related environmental monitoring instruments. participate in or organize, WMO and/or regional instrument intercomparisons, following relevant CIMO recommendations. contribute positively to Members regarding quality of measurements according to relevant recommendations on the WMO Quality Management Framework. advise Members on inquiries regarding instrument performance, maintenance and the availability of relevant guidance materials. actively participate in, or assist in the organization of regional workshops on meteorological and related environmental instruments. cooperate with other RICs in standardization of meteorological and related environmental measurements. regularly inform Members and report, on an annual basis, to the president of the Regional Association and to the WMO Secretariat on services offered to Members and activities done.